MovingTruckRental.net is on the road again. We are continuing our search for the best city to call home in the state of Florida. This time we are looking at a city that is located right in the middle. It is home to some of the largest theme parks in the world, and millions of people flocked to the city every year. This city is called Orlando. Once again, MovingTruckRental.net has hit the streets. We want to know why people decide to call Orlando home. We ask the questions that our viewers want to know the answers to. Keep reading to find out if Orlando is right for you. Orlando was one of the first cities to be developed in central Florida. The official name for Orlando is called, “The City Beautiful.” Orlando is a fairly busy city, and you will always find plenty of things to do day or night. Orlando is not a large city, but it is definitely not a small city either. If you are looking for the New York lifestyle, you will not find it Orlando. Orlando takes up right around 110 square miles of land and water. Most of Orlando is land. Just over eight square miles of Orlando is water. Just over 240,000 people call Orlando home, and if you include the population of many of the smaller cities that surround Orlando, you will be looking at almost 1.5 million people. Orlando is not nearly as crowded as Miami. You can expect to find just over 2000 people per square mile in the city. 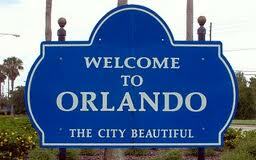 Each year, over 50 million people travel to the city of Orlando. Almost 4,000,000 of these people come from other countries. The Orlando international Airport is a very busy place. It ranks number 13 in terms of the busiest airport in the United States, and it is the 29th busiest airport in the entire world. It does not take a rocket scientist to figure out what fuels the Orlando economy. The main source of income in Orlando is tourism. Orlando is home to several different theme parks, and water parks. It is home to Universal Orlando, Seaworld, Walt Disney World, and a handful of other smaller theme parks. Orlando is also home to some of the best water parks in the world. It gets hot in Orlando, and there is no better way to cool off, then a trip to one of its famous water parks. Orlando is a great place to live, but can you afford the price? The cost of living in Orlando seems to be right on par with the rest of the United States. Of course you will pay a lot more if you are anywhere near any of the many theme parks or attractions. Dinner for two at your average restaurant will run right around $40. You get a full meal for one at a fast food restaurant for six bucks and some change. A dozen eggs will cost right around two dollars, and a loaf of bread will run you around $2.50. Fresh fruits are not expensive. Apples and oranges will cost right around a dollar per pound. One of the more expensive expenses of living in Orlando, is the monthly utility bill. The average monthly utility bill for Orlando is right around $270. In the warmer summer months of June, July, and August you can expect your utility bill to be much higher. It gets pretty hot in Orlando during the summer, and your air conditioner will have to work twice as hard to keep you cool. This is why the utility bill will be higher during the summer months. A three bedroom apartment In the center of Orlando will cost right around $1500 per month. That same apartment will only cost around $1000 per month outside of the city. Orlando is a nice place to live. It is not all that expensive, and it is not very crowded. It gives its residents great access to just about everything that they need. << Thinking About Moving to Miami?